With its high-end designer furniture at affordable prices, the British company MADE.COM has revolutionized the furniture market. 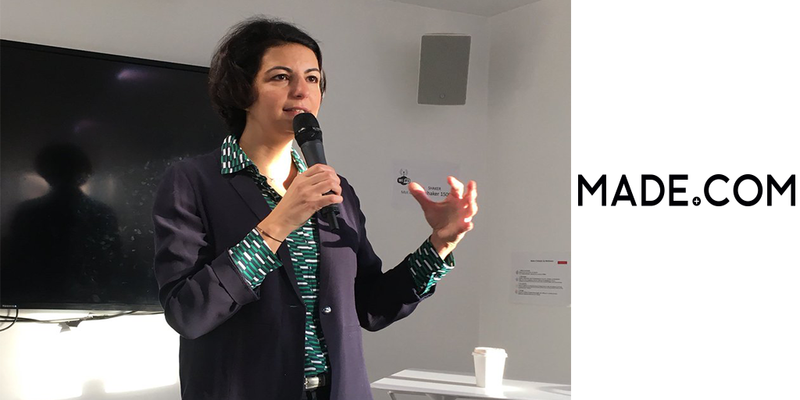 Jessica Delpirou, General Manager France of MADE.COM, who opened the French office a year ago, came to the Partech Shaker to talk about her mission and challenges. She also gave us some insight on how her previous experiences at Meetic, PayPal and ING Direct contributed to the success of MADE. At 41years old, Jessica Delpirou has 20 years of experience in the digital environment, in various industries. She initially held marketing and digital positions before progressing to a business unit management role with Profit & Loss responsibilities. She then worked one year for PayPal where she held marketing and CRM positions, before joining Meetic in Paris as head of France and Southern Europe. She arrived at MADE.COM one year ago to open the French office first from the Partech Shaker, then rue Etienne Marcel. It was a very intense construction period with the hiring of 30 people. MADE was created 7 years ago by 2 French collaborators based in London. They had a very clear vision of the furniture market, which had not been disrupted since the arrival of Ikea 60 years previously. Customers could choose from only the standardized Ikea offer or the high-end expensive offer of brands like Roche Bobois. The furniture market is very fragmented, spread between the designers; the producers who are often located far away, frequently accessed only through intermediaries; and the distributors. This large number of intermediaries in the value chain increases the selling price for the end-customer. MADE founders decided to break this value chain by working directly with the makers to bring high-end lifestyle design to everyone, everywhere, at a fair price. This marked the beginning of the MADE adventure in London. Today MADE offers designer furniture at affordable prices, with a presence in 8 countries. The UK, France and Germany are their main markets and European expansion is ongoing. - Recruitment: the French office expanded from one person to 30 in just one year. Jessica used her networks and LinkedIn, rather than a HR manager or headhunters. Her recruiting choices were driven primarily by her intuition and her number one criteria - commitment. She chose highly-motivated profiles with a strong attraction for brands. They trained directly on the job and today, her team remains just as motivated as on day one. o Focus on the customer experience, a key topic for any e-commerce model: logistics and delivery are quite complicated with furniture. During the summer of 2016, MADE experienced a crisis when delivery could not keep pace with the company’s strong growth. MADE focused on their suppliers and transferred their customer service from London to Paris. They also used an NPS tool to measure customer satisfaction. Although it was the more expensive option, you transferred your customer service to France. Why? Our clients are very demanding, and our customer service is the only contact point with them. At ING Direct, we had the same scenario. A local customer service enables you to be more agile: you can provide feedback to your marketing service and resolve some issues faster. At MADE, as we really need a highly qualitative customer service, we accept to pay a steeper price. Why did you choose to have a physical presence via your showroom? Is this profitable? We do generate direct sales via our showroom, but this is not the key objective. Our showroom is our brand’s showcase. We view it as a marketing tool and not a retail one. We organize regular events such as design workshops for customers or press events with influencers, to build awareness around our brand. Our showroom is even listed in Timeout as the place to be! I compared the Paris showroom growth to that of other cities and the difference is huge, proving the positive impact of the showroom on our sales. Is there any internal competition between countries? Not at all. We all have the same issues and I am in favor of information sharing. For example, regarding the sales, with Germany I discussed which products to put on sale or which discount level to apply. Budget allocation depends on the management. ROI will always be higher in the UK than in France because British media are cheaper. But MADE is driven by a long-term vision: build a European leader, which requires traction on at least 4 countries. Have you noticed any differences in management methods from one country to another? I really enjoyed the Netherland approach of the ING Direct management team. It’s a bottom-up approach: they expect a lot from their teams but in a well-meaning and transparent way. They have a very international culture, driven by their small size and their perfect mastering of English. While Meetic is one of the few French companies which was successful in their internationalization, the Meetic management team was more controlling. MADE has a hybrid culture, being a French company based in London with a French and English management team. Because of our Anglo-Saxon culture, we tend to focus more on business issues. Can you talk about your different investments steps? MADE is supported by several investment funds: Partech Ventures, Fidelity and some private investors including the founder of Lastminute.com. The last round of fund raising was intended to support our international growth. Our business model is based on volume, so to be profitable, we need to expand. We have already proven the efficiency of our model as the UK territory is now profitable. Our French activity is growing fast, supported by a dynamic furniture market as low interest rates encourage people to move or to re-furnish their home. As a country manager for MADE, what have been your biggest challenges? By far the logistics and transport issues, which are essential in our business. We grew quickly and we now need to automatize our logistics flows so that we can absorb this growth. MADE has two warehouses in London, one for the UK market and another for the rest of Europe. We work with local transport companies. What is MADE’s special recipe for success? - Our story-telling: our products target millennials. They are the ones buying more online and they have similar design taste, whether they are located in Paris, London or Berlin. We have managed to build a brand that they like, based on our products. - Our capacity to seamlessly execute our brand deployment, customer experience and logistics from one country to another. How is your design team organized? We have a team of 10 international internal designers and we also work with around 100 external designers from all over the world. We launched the Talent Lab, a crow-sourcing project platform. Young designers or creative artists can post their project on the platform and the projects that are the most liked by consumers can have access to our production and distribution network. In the future, these new designs will represent between 5% and 10% of our total sales. We launch around 30 products per week. We have no stock, which enables us to take more risks in terms of design. We work with a negative WFR. Working with no stock means that our delivery delay can be a bit long. Our clients know this and accept it; they understand our business model and the fact that you cannot get affordable good quality products more quickly. Our products are made in China, Vietnam, the United Kingdom, while small products are manufactured in Portugal.